All too often, when we discuss in the motives of white male mass murderers in the media, we become fixated with the status of their mental health and whether or not mental illness may have played a role in their actions. In the case of atrocious shooting in Charleston, South Carolina at the historic flagship Emanuel African Methodist Episcopal church, we have somehow managed to fall victim to this useless conjecturing again, despite the Pro-Apartheid and neo-colonial signifying patches with which the shooter adorned his jacket. As this familiar hemming and hawing becomes United States narrative, I have become fiercely disinterested in the discussions about the mental health of the perpetrator in the context of these shootings, as they serve myriad destructive purposes. It privileges the perpetrators with the luxury of our understanding; it inaccurately paints mental illness as a precursor to destructive acts; and it neglects the mental health needs of those who were victimized or directly affected by the event. If we want to talk about mental illness in the context of Charleston, South Carolina, let’s do so from a framework that makes sense. Let’s talk about how a pattern of racialized violence, systemic oppression, and the constant invalidation of our lived experiences can contribute to people of color experiencing mental distress—particularly the symptoms associated with trauma. From a social work perspective, practitioners and scholars understand mental heath distress as resulting from the delicate interplay of many factors: biology and environment; the quality of social and familial support; the effects of various oppressions on an individual; the impact of traumatic events; and access to things which fulfill our basic human needs (such as nutrition, shelter, healthcare, etc.). There’s no magic, mechanical mixture that will shield a person from experiencing symptoms of distress; however, negative changes in any of these areas can certainly make us more vulnerable. In the DSM, the diagnostic manual used by mental health professionals in the United States, the criteria for a “traumatic event” has historically been narrow. In the current edition, an event is traumatic if the person having a distressed reaction was a firsthand witness and feared for their bodily integrity or for the bodily integrity of others directly involved. The case for secondary traumatization can be made, but only if the person in distress is hearing about the event repeatedly from a firsthand witness. A narrow definition like this excludes the anguish black families and individuals experience each time one of these racially charged acts of violence on black life occur, shattering the illusion of safety. However, a growing group of mental health professionals who work from a “trauma-informed” lens is calling for a broadened definition of what trauma is and who can experience it. Make no mistake about it: the family members of the victims of this horrific event, along with the other witnesses and their family members, would almost absolutely meet this criterion should they begin to experience distress. However, one might broaden this scope to include any American black person who feels the earth shattering beneath them on the heels of this news. In her book, Cultural Competence in Trauma Therapy: Beyond the Flashback, psychologist Dr. Laura Brown discusses the nuances of broadening the field’s imagination of a trauma definition; particularly focusing on what would constitute an event being perceived as “life-threatening”. Dr. Brown offers an example of a patient she saw, a black veteran who joined the civilian office-space workforce upon returning from his last tour of duty. This patient experienced PTSD-like symptoms, particularly feelings of intense dread and fear for his safety when white office colleagues would use the “N” word in his presence. The colleagues were engaging in micro-aggressions, though they did not intend to be malicious. They enjoyed getting a rise out of him, believing it was humorous that a word could make him so uneasy. However, the cultural history the word is so deeply steeped in made him fearful to hear others say it; he described the world as feeling “unpredictable” when his peers used the word. He felt that being in active combat was almost preferable to being in this new white water-cooler world, as at war he “knew who the enemy was,” yet in the office, moment to moment remained “unpredictable”. Furthermore, Brown discusses “Just-World Theory” and the shattering of it’s accompanying illusion as a cite of trauma, particularly for people of color. Just-World Theory dictates that the world is basically a fair place and that if a person is good and does what they are supposed to do, all opportunities will be extended to them and they will be guaranteed to skate along in life. When the illusion of a just world is shattered, Brown and other colleagues believe that this alone can cause trauma. While the Just-World Theory has been shattered for many years for most black Americans past a certain age, what could shatter this illusion more than members of our community being killed in cold blood as they worship? Imagine the knowledge of our unjust world that a five-year-old must already hold, to have the insight that she could decrease her chances of certain death by playing dead. In my opinion, this instance—along with the litany of other assaults leading people of color in America to feel as if we are at constant risk of victimization—can absolutely constitute as “life-threatening.” We continually live the unpredictable, day in and day out, and endure triggers—both literal and figurative—at every moment. While I consider myself to be Agnostic in faith, there is no denying the influence of the black church in my life. My family belongs to one and many Sundays as a young child were spent immersed in the spirit of my neighbors praising their Lord in jubilance, their full-bellied voices joining together in luminous song. It is one of the most beautiful places to be in this world, and you encounter some of the deepest love you’ll ever know in other churchgoers. There is something so universal about the black church and its experience. 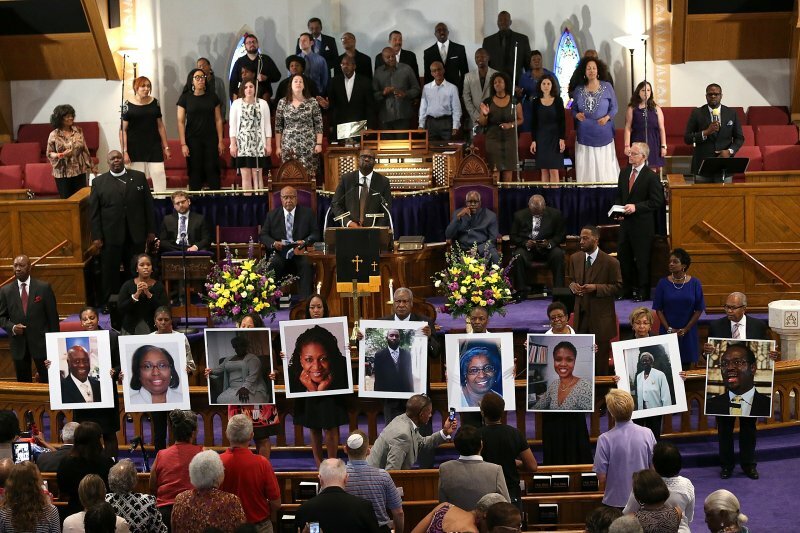 When news broke about the Charleston shooting, I sobbed myself to sleep; weeping for the lives lost senselessly to an act of deep hatred, and for their families who will have to contend with the mixture of their grief and the inevitable complicated emotions that will arise for them. I wept too for the unpredictability many of us feel when the next time life—particularly black life—will be utterly disregarded or actively sought out and destroyed. Last week, images came to mind of family and neighbors who regularly attend these historic houses of black worship and I imagined them having to fight for their lives in what is supposed to be their one refuge. Then I cried in cab rides and on the subway and on my walk home and anywhere and absolutely everywhere. Discussing this with friends showed me that I was not alone: the brightest and most brilliant of my brothers and sisters have been enduring panic attack after panic attack and sobbing in break-rooms and classrooms. This grief and its subsequent reactions is not pathology. A deep denial about what exactly this event is and was—an act of domestic terrorism—continues to permeate the air, as those who could never understand what it is like to walk these shoes ransack their brains for any other explanation for what could have motivated the perpetrator besides race. That reaction is deeply invalidating and disenfranchises our grief. As people of color in America, we know what racism is. To imply otherwise underestimates our intelligence and is deeply insulting. To even begin to heal these wounds, folks suffering need allies and, above all, need one another. This understanding, this active listening in simply bearing witness to grief is only the very first step on the way to wholeness as a people and as a nation. It is how we begin to acknowledge, and thus, heal from our trauma. Michelle Marie Charles is a social worker who is deeply invested in the politics of identity, pleasure, total bio-psycho-social-spiritual health, and justice at all levels for all people—especially those who are underrepresented and subject to myriad oppressions. She is also a practicing artist who encourages dialogue through the creation of multimedia art, mainly using photography and video as her mediums. She has exhibited widely at venues such as the Bronx Museum of the Arts, the Queens Museum of Art, and Cue Arts Foundation. Michelle has written essays for xoJane magazine and previously for For Harriet.